With the Spring Classics officially over, cycling fans’ attention now turns to the first Grand Tour of the year, the Giro d’Italia. I started following the Giro back in 2010 when Ivan Basso won. Back then, I didn’t know much about the Giro and over the years I’ve slowly learned to appreciate the beauty of this race. So, I thought I’d do some research and share with you some very interesting facts and statistics that would make you better informed about the race when you watch it, whether it’s on the TV or in person in Italy. The Giro d’Italia was started by a local Italian newspaper, La Gazzetta in an attempt to increase newspaper sales. The first race was held on 13th May 1909. 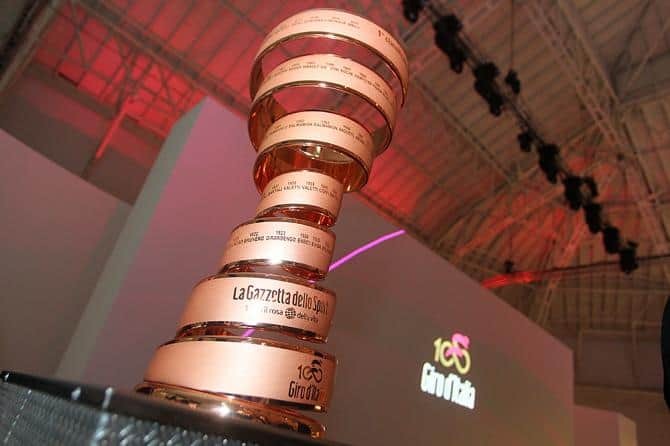 The main theme color of the Giro d’Italia is pink because the La Gazzetta newspaper is pink in color. The women equivalent of the Giro d’Italia is the Giro Rosa which started in 1988. In 2018, it’s a 10-day stage race held from 6th to 15th July. 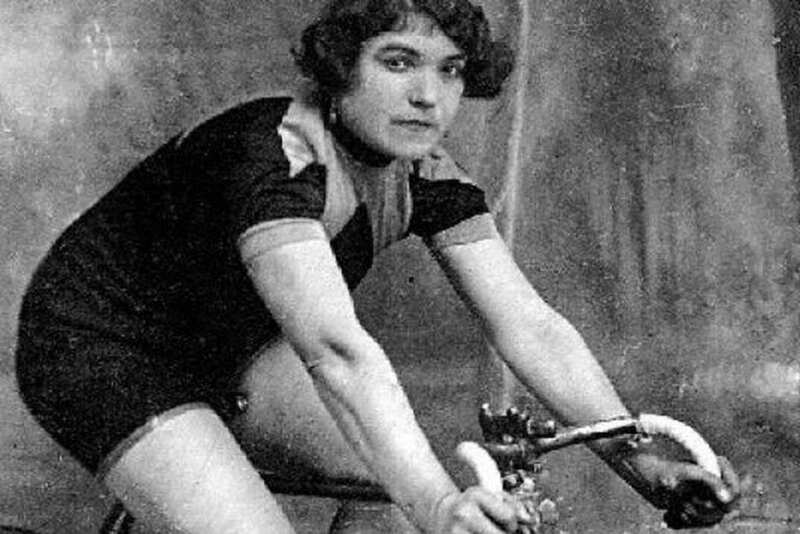 In 1924, an Italian woman, Alfonsina Strada took part when organisers mistaken her as a male. She remains the only female to have ridden the Giro d’Italia. Throughout its century old history, there were 9 years where the Giro d’Italia wasn’t held, which was during World War 1 and 2. 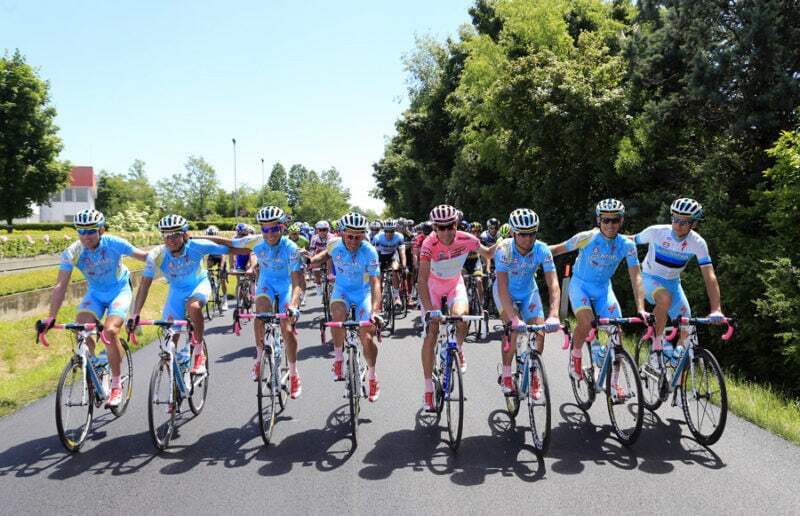 Today, the Giro d’Italia is broadcasted to over 800 million people in 174 countries. The Giro d’Italia is considered as one of cycling’s 3 major Grand Tours besides the Tour de France in July and Vuelta Espana in September. The start of the Giro d’Italia is called the Grande Partenza. Even though the Giro d’Italia is an Italian cycling race, it doesn’t always start in Italy. Since the 1965, the Giro d’Italia has started outside of Italy 13 times; in San Marino (1965), Monaco (1966), Belgium (1973, 2006), Vatican City (1974), Greece (1996), France (1998), Netherlands (2002, 2010, 2016), Denmark (2012), Northern Ireland (2014) and Israel (2018). The Giro d’Italia is owned by an Italian sports and media company, RCS Sports. It also owns other Italian cycling races such as the Milan-San Remo, Tirreno Adriatico and non-cycling events such as the Milan Marathon. The longest road stage was 430km from Lucca to Rome held on 28th May 1914. It was won by Costante Girardengo in 17 hours and 28 minutes. The shortest road stage was 30km from Montecatini to Prato in 1946 which the Italian Antonio Bevilacqua won. The longest Giro d’Italia was held in 1954 with a total distance of 4,337km. Swiss Carlo Clerici won in a total time of 129 hours and 13 minutes. The shortest Giro d’Italia was in 1912 with only 2,444km over 9 stages. The fastest road stage was at Foggia in 1985, where Italian Stefano Allocchio won with an average speed of 50.123 km/h for a 45km stage. The fastest average speed of a Giro d’Italia winner is 40.164km/h, ridden by Dennis Menchov of Team Rabobank in 2009. The slowest average speed of a Giro d’Italia winner is 23.437km/h, ridden by Alfonso Calzolari in 1914. Belgian, Rik Verbrugghe rode the fastest time trial stage at 58.874km/h in the 7.6km prologue in 2001. Italian Stefano Garzelli recorded the lowest average speed for a stage win at 18.67km/h in the 2010 uphill time trial on the Plan de Corones. 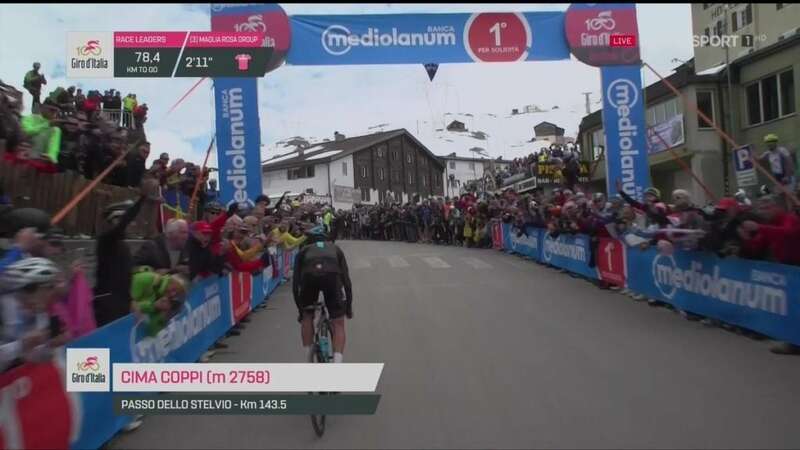 Vincenzo Nibali, riding for Team Astana holds the lowest overall time of a Giro d’Italia win, 84 hours and 53 minutes covering 3,341.8 km at an average speed of 39.092km/h. The longest time taken to win a Giro d’Italia is 144 hours and 15 minutes by Alfredo Binda in 1927. He covered 3,758 km at an average speed of 26km/h. 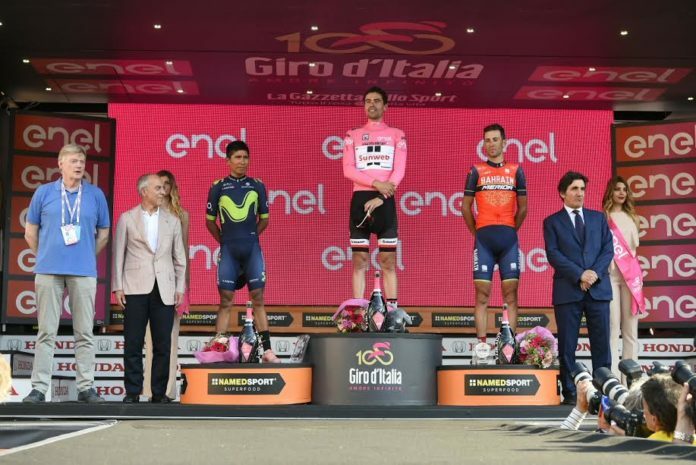 The Giro d’Italia celebrates its 101st edition in 2018. It runs from 4th to 27th May 2018 with 21 stages. The first 3 stages will be held in Israel and the remaining in Italy. The total distance in 2018 is 3546.2km or an average of 168.9km/day. The longest day is Stage 10 at 239km from Penne to Gualdo Tadino. The last day is the shortest day around Rome at 118km. 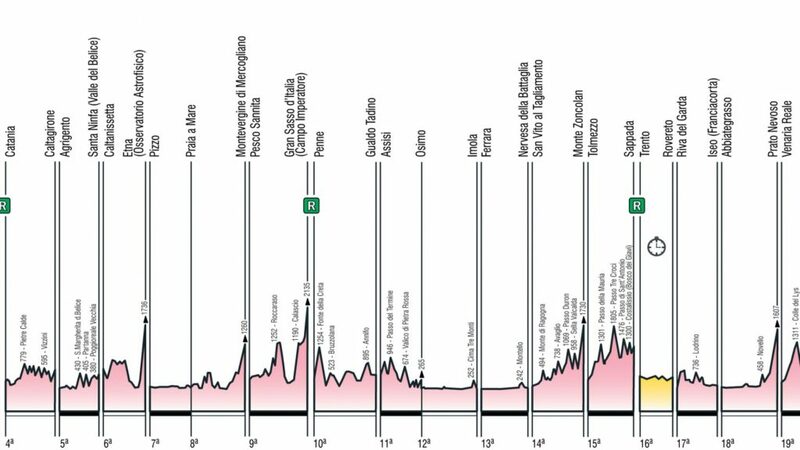 There will be 3 rest days in the 2018 Giro d’Italia on Day 4, 11 and 18. Even though it’s a rest day, the riders do get out for a 2-3 hours easy ride to ensure the body don’t shut down for the next day. It’s the first time the Giro d’Italia starts in Israel. 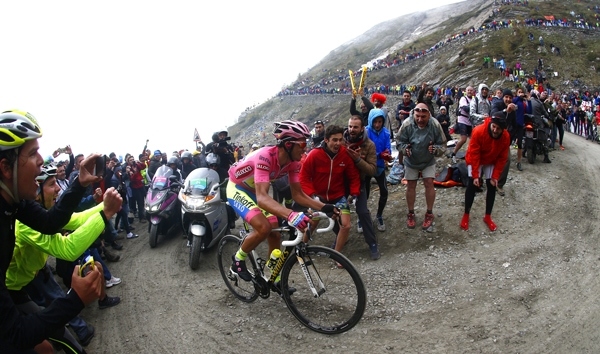 It’s also the first time the Giro d’Italia starts outside of Europe since its inception. It’ll be only the fourth time the Giro d’Italia finishes in Rome. The other years were 2009, 1950 and 1911. There are two Individual Time Trial (ITT) with a total distance of 34.5km. The total elevation gain on all the 39 categorised climbs are over 44,000m which equals to going up Mount Everest 4.5 times. There are a total of 8 summit finishes with 4 of them in the final week which will determine the overall winner. The highest point this year, the Cima Coppi is the Colle delle Finestre at 2,178m above sea level. The Colle delle Finestre was the Cima Coppi once previously in 2015 which was won by Mikel Landa of Team Sky. It has also featured in the Giro d’Italia in 2005 and 2011. Shimano will provide the neutral service support in 2018 which comprises of mechanics, spare wheelsets and spare bikes in case a team car couldn’t get to the rider during critical periods in the stage. 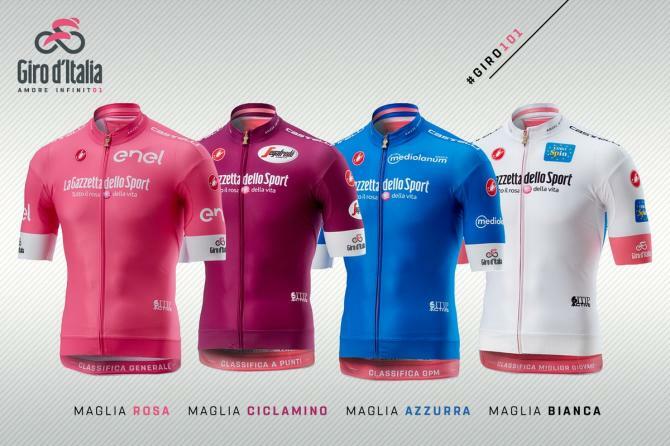 Italian cycling apparel maker, Castelli is making a comeback to the Giro after a 26 years absence. 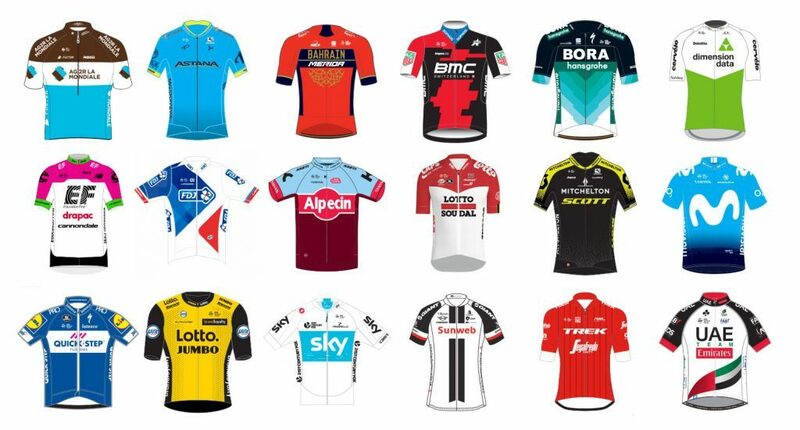 Castelli will provide all the jerseys for the various classifications from 2018 until 2021. There is a total of 22 teams in 2018 made up of all 18 World Tour teams and 4 wildcards. The organizer has the discretion to decide which Pro-Continental (a rung lower than World Tour) team to invite as a wildcard. Each team fields 8 riders with a total of 176 riders. The number of riders per team is reduced from 9 to 8 this year for safety concerns. Based on the provisional start list, there will be 30 different nationalities of riders starting the Giro d’Italia. 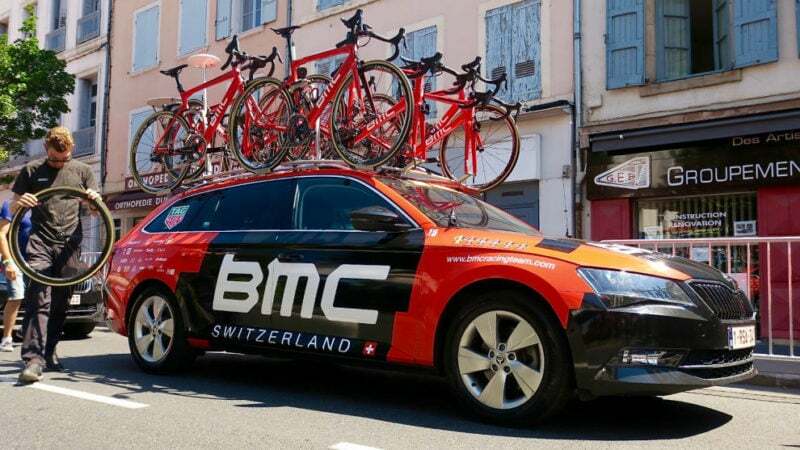 Each rider will have at least 2 road bikes and a time trial bike. Team leaders usually have 3 road bikes and 2 time trial bikes. 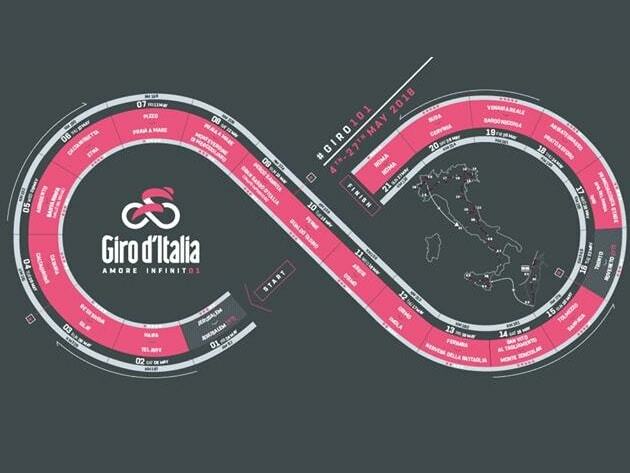 There will be over 500+ bikes at the Giro d’Italia and over a thousand set of wheels. The winner’s trophy is known as the Trofea Senza Fine which has been awarded since 1999. All the winner’s name are carved on its spiral surface. The leader of the race wears the pink jersey called the Maglia Rosa. No one wears the Maglia Rosa on the first day, not even the previous year’s winner. Between 1946 to 1951, there was Maglia Nera, or the black jersey. It was awarded to the rider who finishes last in the Giro. It was then scraped off to avoid riders deliberately wasting time just to win this jersey. 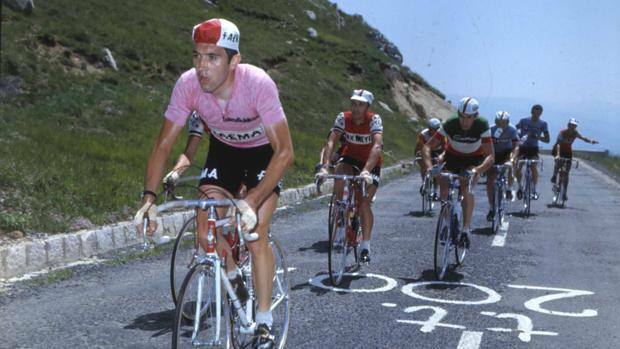 Eddy Merckx spent the most days in the Maglia Rosa with 78 days, followed by Francesco Moser with 57 days, Gino Bartali with 50 days, Giuseppe Saronni with 49 days, Jacques Anquetil with 42 days, Fausto Coppi and Bernhard Hinault with 31 days each. The overall winner is the rider having the shortest total time. He doesn’t need to win every day nor even win a stage. There were 14 Giro d’Italia winners who didn’t win a stage en route to overall victory. There are 4 riders who have led the Giro d’Italia from the start to finish. Costante Girardengo in 1919, Alfredo Binda in 1927, Eddy Merckx in 1973 and Gianni Bugno in 1990. The first winner was Italian, Luigi Ganna in 1909 and the 2017 edition was won by Dutchman, Tom Dumoulin. Nairo Quintana (2014) and Evgeni Berzin (1994) are the only rider to have won both the general classification and best young rider classification in the same edition. Fausto Coppi is the youngest ever Giro d’Italia winner at 20 years and 158 days when he won in 1940. Fiorenzo Magni, at 34 years and 180 days is the oldest Giro d’Italia winner in 1955. 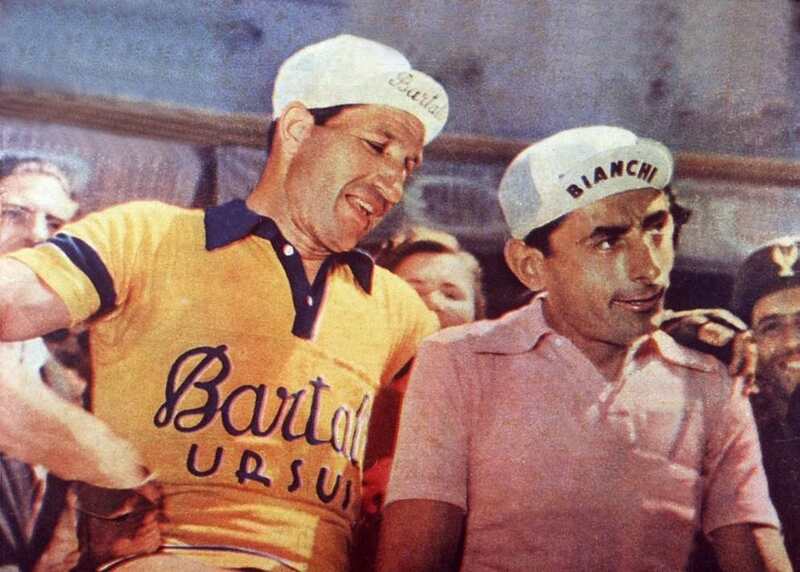 The Giro d’Italia is won 5 times by Alfredo Binda (1925, 1927, 1928, 1929, 1933), Fausto Coppi (1940, 1947, 1949, 1952, 1953) and Eddy Merckx (1968, 1970, 1972, 1973, 1974). Frenchman, Bernard Hinault holds a 100% winning record, winning 3 times out of 3 participations in 1980, 1982 and 1985. 22 riders have won the Giro d’Italia more than once. The only active rider in the peloton today who has won it twice is Vincenzo Nibali in 2013 and 2016. The other active riders to have won are Damiano Cunego in 2004, Nairo Quintana in 2014 and Tom Dumoulin in 2017. 62 riders from 13 different countries have won the Giro d’Italia at least once. Italians riders dominate the Giro d’Italia, with the most Giro d’Italia wins (69), followed by Belgian (7) and Dutch (6). The first non-Italian winner was Swiss, Hugo Koblet in 1950 riding for Team Guerra-Ursus. 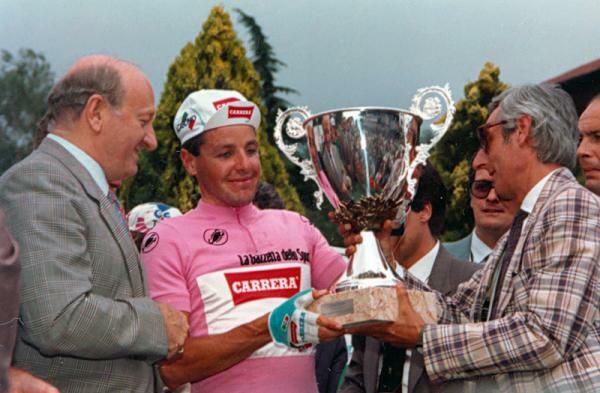 Irishman, Stephen Roche was the first English speaker to win in 1987, riding for Team Carrera Jeans-Vagabond. The first and only American to win is Andrew Hampsten in 1988, riding for Team 7-Eleven-Hoonved. Italian sprinter, Mario Cipollini won the most stages (42). He last won in 2003 in Montecatini, just near his home in Lucca. 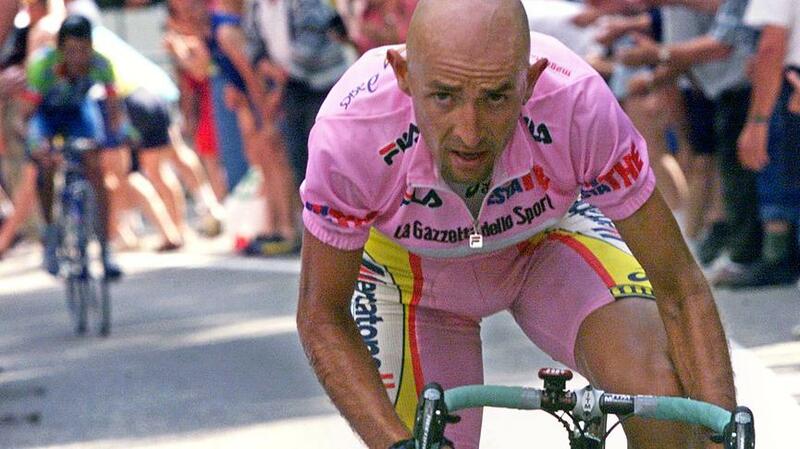 The last rider to win the Giro d’Italia and Tour de France in the same year is Marco Pantani in 1998. Only 10 riders in history has achieved a double Grand Tour win in a calendar year. There are 7 riders who have achieved the Giro/Tour double. There are two father and son who has won stages in the Giro d’Italia. Eddy and Axel Merckx and Pierino and Adriano Baffi. The total prize money available is €1,377,210, which is split among the various competitions. 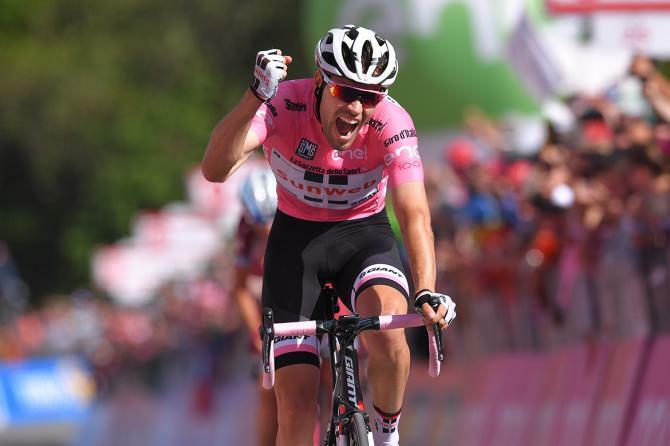 The overall Giro d’Italia winner is expected to pocket at least €205,668, which is made up of €115,668 for the overall win and €90,000 for special prizes. The total amount is higher with the addition of prize money from stage wins and wearing the Maglia Rosa. Traditionally, the winner doesn’t keep this amount but splits it among his teammates and the team’s support staffs. The second and third place overall will pocket €104,412 and €48,801 respectively, excluding any prize money for stage wins or wearing the Maglia Rosa. The 10th placed overall finisher will pocket almost 50 times lesser than the overall winner with €4,363. The winner of the Maglia Ciclamino pockets €10,000, Maglia Azzurra €5,000 and Maglia Bianca €10,000. Each day in the Maglia Rosa (race leader’s pink jersey) nets the wearer a cool €1,000. The top 3 stage finishers pocket €11,010, €5,508 and €2,753 respectively. Prize money is given to the top 20 stage finishers.